Are you ready for stairs that you can excited about? How about stairs that won’t be over looked? What about a set of stairs that will get you excited to take those steps up to your comfy bedroom? The stairway can easily be over looked and forgotten, but with a little love and attention it can become an eye catching space. It’s a canvas ready for you to pick up the design brush and paint the space with your personal style. The stairs offer a lot more design space and many more options than meet the eye. The space gives you the walls that the stairs follow up, the space before the stairs, the banisters and the stairs to create a stairway that you can be excited about. When people come into your home for the first time they won’t only be greeted by your beautiful entryway, but they’ll also give your stairway some much deserved attention as well. 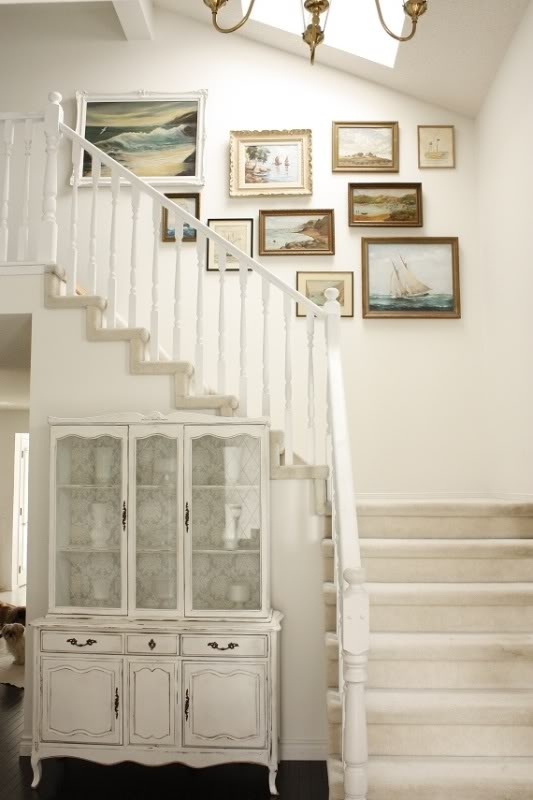 Hit the walls with coastal wall art and create a beautiful gallery wall to fill what would otherwise be empty space. The art fills the blank walls and utilizes what most would see as unable space. Try adding a mirror to open up the stairs. It allows more light and gives the person looking into the mirror a sense of open space. Looking to add a little more nautical flare? How about ditching those traditional banisters and swapping them out for a rope banister? Is that nautical enough for you? 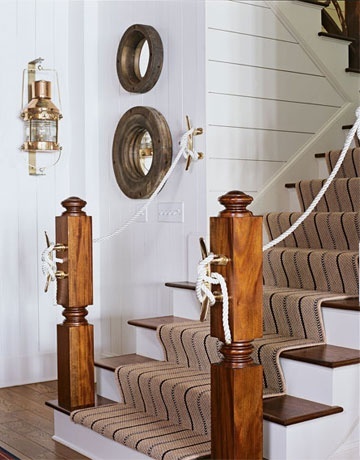 Rope banisters are the ultimate coastal addition and instantly invoke the feeling of being aboard a boat. Don’t forget about the stairs themselves. They too can be used to as a design detail in the space. 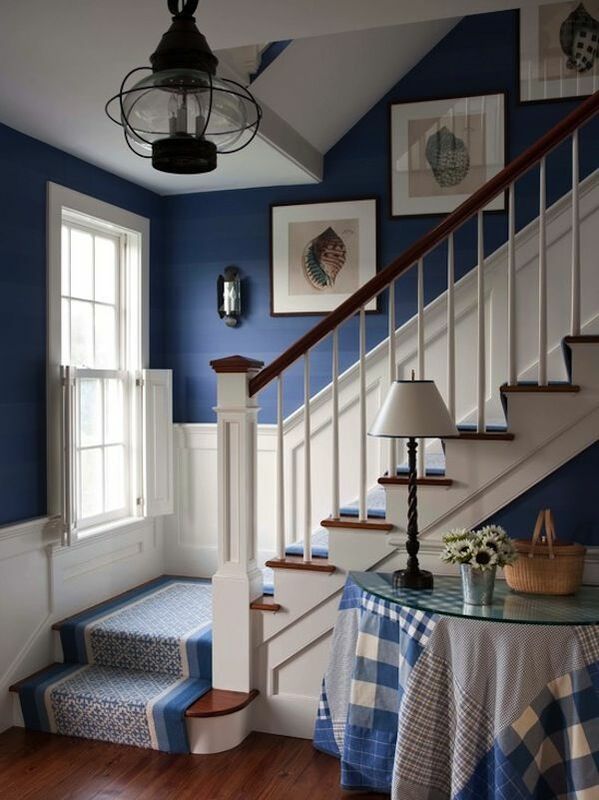 The stairs can be painted or covered with a stair runner. Stair runners offer a great range of color and texture options for your stairway. It allows you to mix up the materials that can be on your stairs as well. Lastly, you cannot forget about the space before the stairs. It sets up the stairway and acts almost as an appetizer to the main course that will be the stairs. You can help it set the design tone and style for the rest of the stairway. 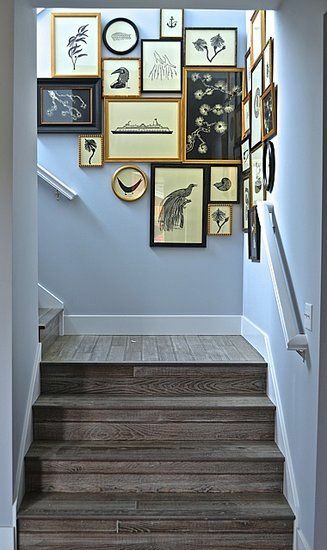 It can compliment the art or the frames while still offering a great look as well. So what are you waiting for? Your stairs are ready to become a standout part of your home! Take a look at these great stairway pictures we’ve gathered and don’t forget to get out there to see what other designers are doing!